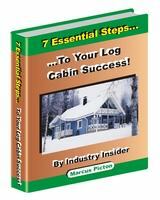 Ultimate Impartial Log Cabin Guide"
With the help of our log cabin survey, we strive to provide the ultimate complete guide for all you log cabin enthusiasts out there. We don't want you to spend days trawling through endless websites, trying to find answers to all your questions. Our goal is to provide you with all the information you will ever need on log cabins, right here! Your feedback is key to ensuring we fulfil our aim. Please take a few seconds to fill out the 3 questions below and you will help shape how our website develops. We already have a ton more content in the pipeline, but we want to make sure it answers all your questions in detail. If you request something, we will certainly do our best to provide information on that subject. We know a lot of you have questions, so don't be shy just fill in this short form, hit the submit button and your done. This is where we take over and do all the work, making sure we meet your needs. What area of log cabins do you want more information on? If you could ask for one thing on this website what would it be?